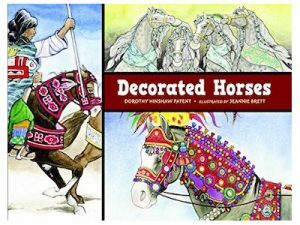 I’ve always loved horses, and when this idea popped up in a conversation with fellow author Jeanette Ingold, I knew I had to pursue it. The result, “Decorated Horses” from Charlesbridge is very dear to a grownup horse loving girl, and I’m delighted by Jeannie Brett’s beautiful and lively illustrations. The relationships between people and animals is one of my favorite topics, and over thousands of years people have related to horses in so many different ways, as partners in war, celebration, transportation, and just plan companionship. And so often, people have decorated their horses in creative and/or useful ways to carry out their jobs and to show them off. I’m especially attached to the story about the Chinese Emperor’s Dancing Horses after spending quite a bit of time in China and admiring the silver cup that carries an image of one of these horses in a museum in Beijing. I’ve also admired and been fascinated by the Sythian people–especially proud and independent residents of the Steppes who bred some of the fastest and most hardy horses ever and who decorated their own bodies with complex and beautiful tattoos. Unfortunately, since they had no alphabet, we know very little about their horse and deer oriented culture. I think of this book as a sort of summary of some of the relationships I found especially interesting and beautiful, giving readers ideas for topics they might want to pursue in more detail. Or, they can just enjoy learning about the variety of our interactions with these beautiful and useful animals.